1. Heat the milk until warm to the touch, add the yeast, whisk to combine and leave in a warm place for about 5 minutes until foaming and active. 3. Lightly flour a work surface, and knead the dough with your hands for 1 minute. Shape the dough into a smooth ball and place in a large, lightly oiled mixing bowl. Cover with cling film and leave to prove in a warm place for 1-2 hours until doubled in size. 4. Lightly flour the work surface again and knead the dough very gently for 1 minute. Roll out to just over 1cm thick. Using round cookie cutters, stamp out circles from the dough, roughly 8cm in diameter. Using a smaller cutter (4-4½cm), stamp out a smaller circle from the middle of each doughnut. 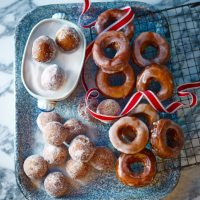 Arrange the ring and mini doughnuts on 2 lightly floured baking trays, cover loosely with oiled cling film and leave to rise again for 30-45 minutes until doubled in size again. 5. Pour the oil into a large, shallow saucepan; it should come at least halfway up the sides of the pan. Heat to 180°C; measure the temperature with a sugar thermometer. (Alternatively, use a deep-fat fryer.) Cover a large baking sheet with three layers of kitchen paper; tip the caster sugar into a large bowl. In a small bowl, mix the icing sugar with just enough lemon juice (about 3-4 tsp) to make a smooth, drizzly icing. 6. Fry the doughnuts in small batches for about 1-2 minutes on each side or until lightly browned. Remove with a slotted spoon and drain thoroughly on the kitchen paper before tossing the round doughnuts in the caster sugar and brushing the rings with the lemon glaze. Make sure that the oil comes back up to temperature before frying the next batch. Best eaten on the day of making.